The Out n About Nipper Double Shopping Basket provides a spacious area for you to store your essential items for your children. The Out n About Nipper Newborn Support can be used in conjunction with the low-lie position of the reclining seat to provide great support to babies. Easily attached to the harness straps. *Please note that this product is not compatible with vesion 1 strollers. Out n About EVA Wheel Set contains lightweight, durable and puncture proof wheels. The Out n About Nipper Double v4 Pushchair from the award winning Out n About Nipper Collection comes in a range of stylish unisex colours, and the lockable 360 degree swivel front wheels mean that you can stay in complete control of your darling duo at all times. The sturdy lightweight black frame (except Lagoon Blue) is made of aluminium and weighs a surprisingly small 12.8kg. What’s more the compact folding design of the Out n About Nipper Double v4 Pushchair and a new auto-lock feature makes collapsing and storing this stroller easy-peasy. 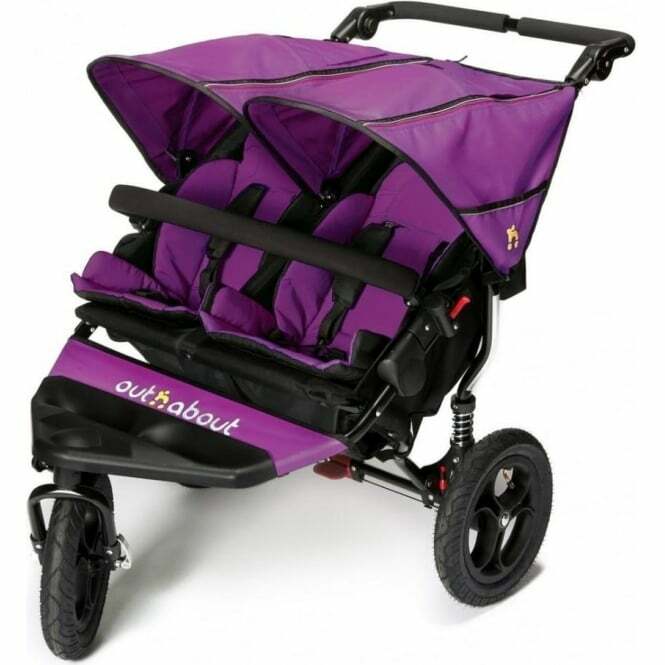 Perfect for any parent wanting a double pushchair that has it all! The seat units are independent of each other making this ideal for either newborn twins or a newborn and a toddler. Why should I buy the Out n About Double v4 Pushchair? The Out n About Nipper Double v4 Pushchair is suitable from birth. At only 72cm wide, this fantastic stroller is a sleek and slender side by side that easily fits through standard size doorways. Unlike most other buggies, the v4 has a ‘lie flat’ position. Alternatively, add the Nipper Double Carrycot (or two!) to your purchase and make travelling extra comfortable for your newborn(s)! With the multi-position reclining seats, you have a choice of angles at which your little beauties can be seated, so whether they want an afternoon snooze or to look out at the world around them, they will always be comfortable. The individual seat sun hoods have been designed to replace the one large hood on the single v4 version. The one pedal easy-lock brake also helps with control and effortless manoeuvrability. The quick-release wheels allow you to store the Out n About Nipper Double v4 Pushchair in a surprising number of spaces. Independent shock absorbers on the Out n About Nipper Double v4 Pushchair make the ride comfortable for your baby and the pneumatic tyres with a 90 degree easy-fill valve makes it a breeze to push. The belly bars are hinged and padded, and the seat liners are removable and easy to clean. 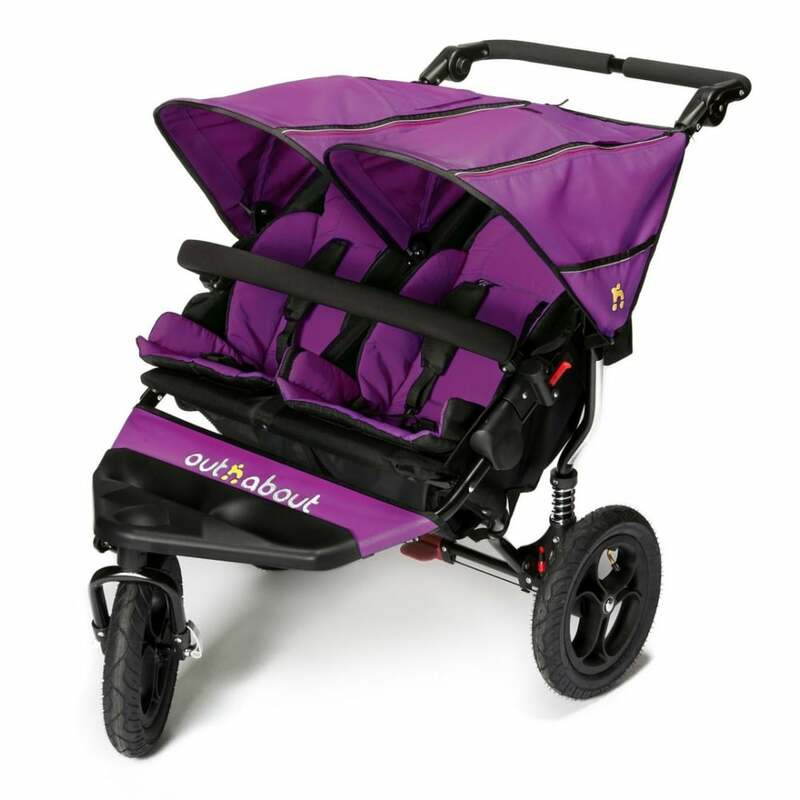 Comfort is further improved by the independent rear suspension and height adjustable handle (77cm - 103cm) to suit parents of different heights. The Out n About Nipper Double V4 Pushchair measures 72 x 96 x 119cm when open and 72 x 42 x 90cm (wheels on) 71 x 36 x 79cm (wheels off) when folded. It weighs 12.8 kg and can take a maximum load of 22kg, meaning that it is suitable from newborn to approx. 4 years. What's in the box for the Out n About Nipper Double V4 Pushchair? Are there any accessories I can purchase in addition to the Out n About Nipper Double v4 Pushchair? Yes. We sell many compatible products that you can add to your purchase. These include (amongst many others) Out n About Nipper Double Sun Mesh, Out n About Nipper Double Carry Bag, Out n About Nipper Footmuff, Out n About Nipper Car Seat Adaptors, and the Out n About Double Carrycot with the Out n About Nipper Double Carrycot Double Adaptor or Out n About Nipper Double Carrycot Single Adaptor. Is there a review of the Out n About Nipper Double V4 Pushchair? Is there a Manufacturers warranty for the Out n About Nipper Double V4 Pushchair? Showing our 15 Out n About Nipper Double v4 Pushchair reviews with an average rating of Excellent. Would you like to write a review? Your Review - Great buggy for my 2.5 yo and new born. So glad i bought it. Easy to assemble, push and get up and down. v quickly too. Your Review - Very happy with this double buggy. Ordered and delivered within two days. Easy to assemble. Good for manoeuvring on pavements and on rough ground. Light to lift and push but feels sturdy an safe. Using for grandchildren of different ages. No shopping basket but enough pockets for everyday items. Your Review - Arrived within two days and we had lots of snow at the time! Fantastic and worth the money. Lovely to push, light and easy to manoeuvre. Pay the extra and get this, it’s built to last! Your Review - Great double buggy for the money. Does what we need it too. Really easy to get around, nice and light. Only problems we have found is the strap pads are not flexible and the strap that comes up between the legs just gets lost in the pads so had to take it off. We bought the basket to go underneath and you cant get into it once on the buggy, a real squeeze so you cant store much in there! And the material edges on the inserts around where the straps feed through are not finished that well with threads hanging off and some I had to cut to get the strap through as they were sealed across the hole for strap. Otherwise we are pleased we picked this one and happy with it. Your Review - Fantastic double buggy for my newborn and 2 year old. Extremely easy to steer, so much storage and very comfortable for the children. Your Review - lovely to push and very good for slightly rough terrain. Bought the twin version for baby grandaughters, overall very pleased. Delighted with our Out and About Double Nipper. Its just a great buggy, so light weight, steers with one hand (definitely not a shopping trolley with a mind of its own). We brought the two carry cots, which are a bit narrow but I think still fine for the twins and it means they are facing me and more protected as the weather turns colder. Its fairly easy to collapse, bit of a pain, have to make sure you have the buggy seats pulled right up, but very light to lift in to car. Mountain buggy the easiest and simplest buggy to collapse - something to be learnt there I think. No shopping basket, you have to buy it separately, which seems a bit mean after spending all that money, but that's my only gripe. I just love this buggy!! Having spent a lot of time researching double buggies we purchased the out n about double. It's a fantastic double buggy, very easy to put up & collapse & excellent manoeuvrability. The stroller is great, very light and so manoeuvrable and looks very carefully designed, it's also very sturdy with the handle height adjustment for taller dad's overall very very pleased with the product. My double buggy gets a lot more wear than the average normal family use, so I needed one I could rely on. I am NOT disappointed. I am extremely pleased. It is super easy and light to push, even with two heavy toddlers in. It is slightly narrower than my old one, which makes getting in door ways easier. The tyre valves stick out well, so is easy to pump up. I am a very happy Childminder, well worth the money. Ordered an out n about double buggy. Me and the kids just love it, no problems at all.. Delighted with our Out and About Double Nipper. Does everything we want and the included raincover is a lifesaver. Delighted with our 'out n about' double v4. Our toddler daughter likes being side by side with her baby brother so she can see what's going on with him. The Out n About 360 double v4 to accommodate the new arrival (have a 1 ½ year old and wanted a side-by side buggy that’s supports a new born. All items arrived in one box with simple setup instructions, it's ideal for our family and we love it. Couldn't have picked a better buggy!